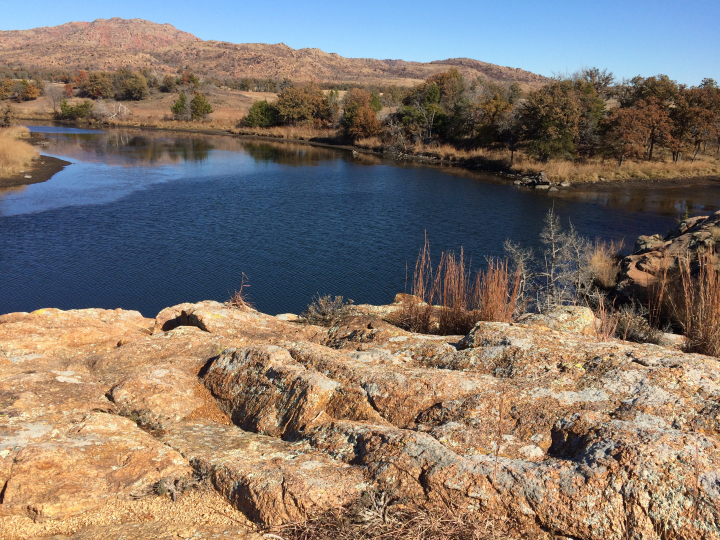 It has been July since we took the trailer out for a camping trip, and colder weather is starting to move in fast, so we decided to try to squeeze a trip to the Wichita Mts. of Oklahoma in before it became too bad up there. We watched the weather forecasts and saw a window of opportunity, so we gave it a try. We had to drive through a rain storm as we neared the Texas/Oklahoma border, but afterwards, we were blessed with good weather. The daytime temperatures were in the 50's and nights in the low 40's and upper 30's -- just about perfect for outdoor activities. It got down to 30 one night and froze our water hose, but we worked around that. 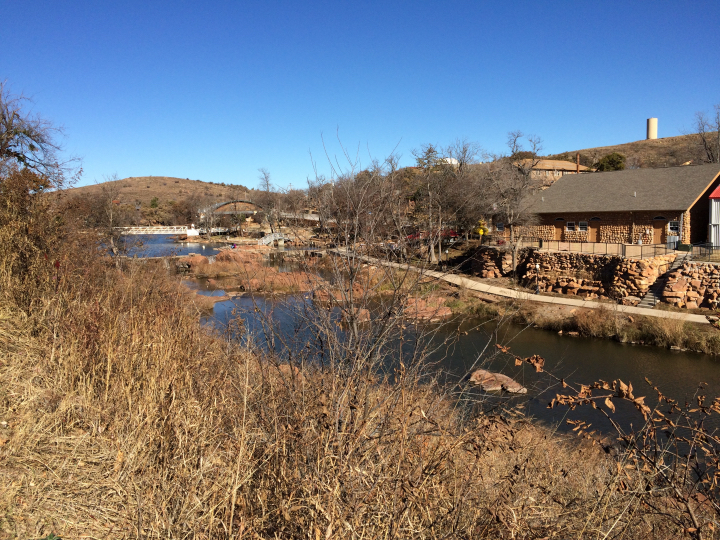 This turned out to be a nice trip and we learned something about a part of Oklahoma that we had not visited before. 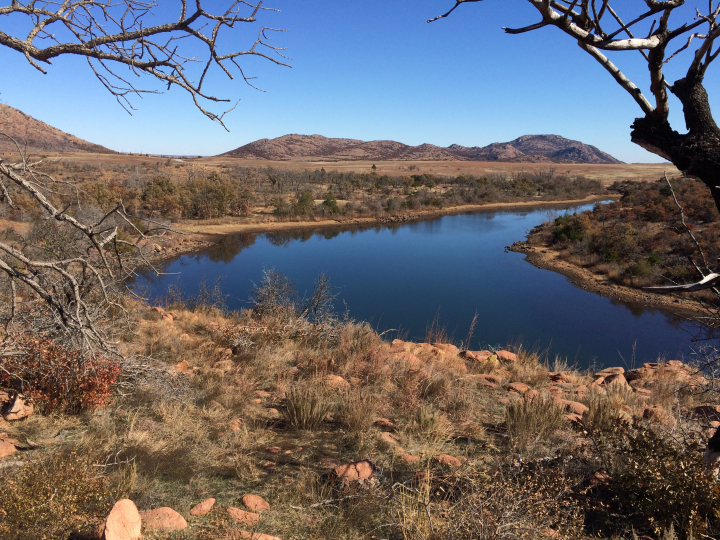 The Wichita Mountains Wildlife Refuge includes 59,020 acres located in Comanche County. In 1907, 15 bison were brought back to the southern plains by railcar from the New York Bronx Zoo and is now around 650 head in the park. Elk were introduced into the park in 1908-12 and now number about 700. Longhorns were introduced in 1927 and now number about 300. 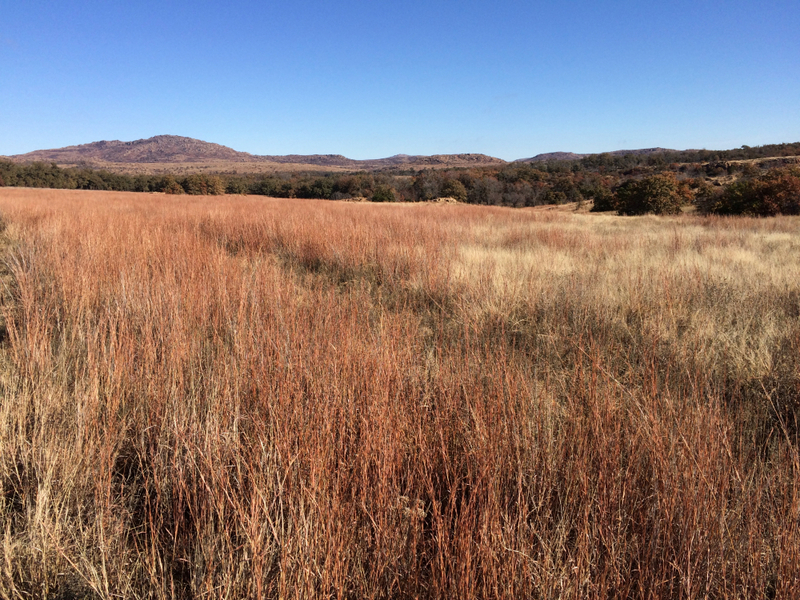 It is also home to large numbers of turkey and deer, as well as several large Prairie Dog cities. The CCC (Civilian Conservation Corps) were instrumental in the 1930's construction of 15 concrete dams for permanent water areas. 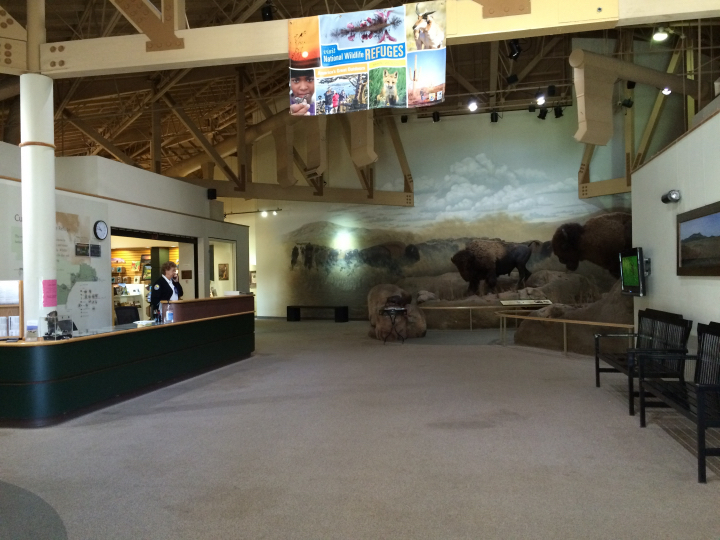 The refuge attracts over 1.5 million visitors each year. [Friday] We left home at 9:30 and went up TX-359 and TX-6 to Hearne, where we stopped and ate lunch. 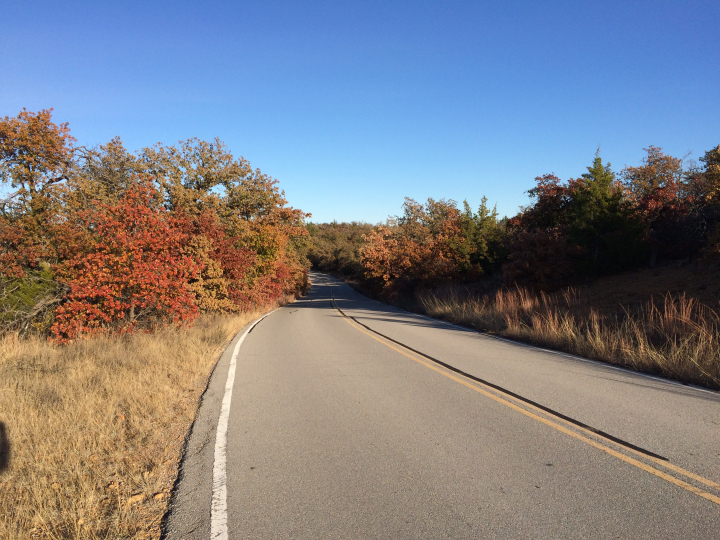 Then we went up TX-171, TX-174, I-35W, I-20 and US-180 to Lake Mineral Wells State Park. We camped in site #66. During the early morning hours, it rained and we got a little bit of hail. 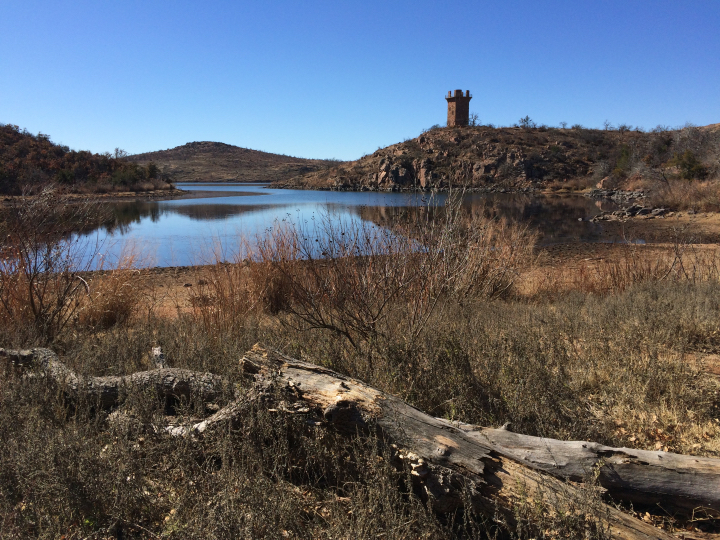 < Lake Mineral Wells is low. < Our campsite. 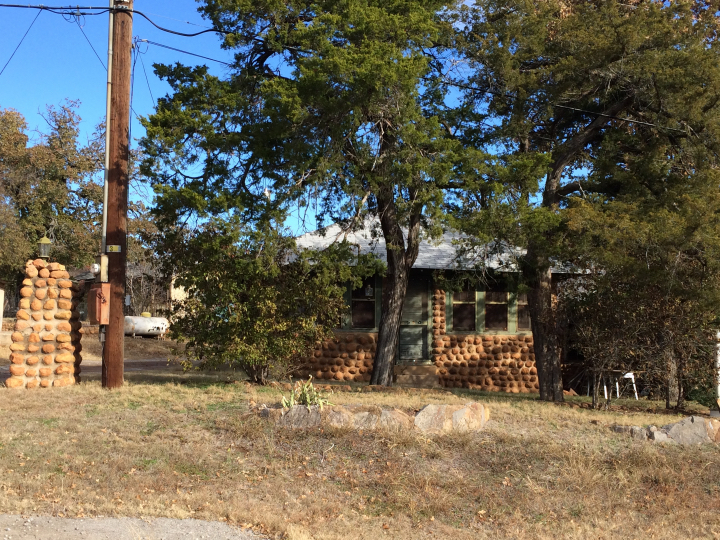 [Saturday] After breakfast, we left Lake Mineral Wells S.P. and drove up US-281 to Scotland, where we stopped and ate lunch. 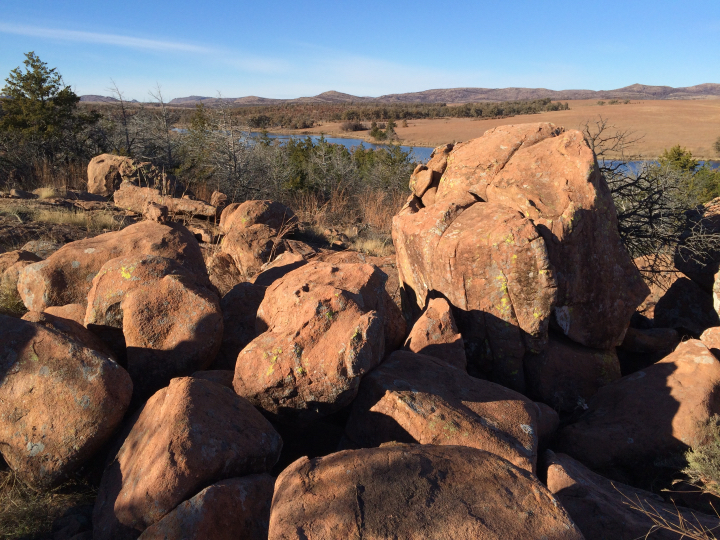 We continued up I-44 to OK-49, then into the Wichita Mts. Wildlife Refuge, Doris Campground, site #50 on Loop B. The rain was very heavy some of the time on the way up. We had to pull over and wait a while for it to slack up as we were going through Burkburnett. Everyone up there was happy to see the rain in the severe drought that exists in this part of the states. 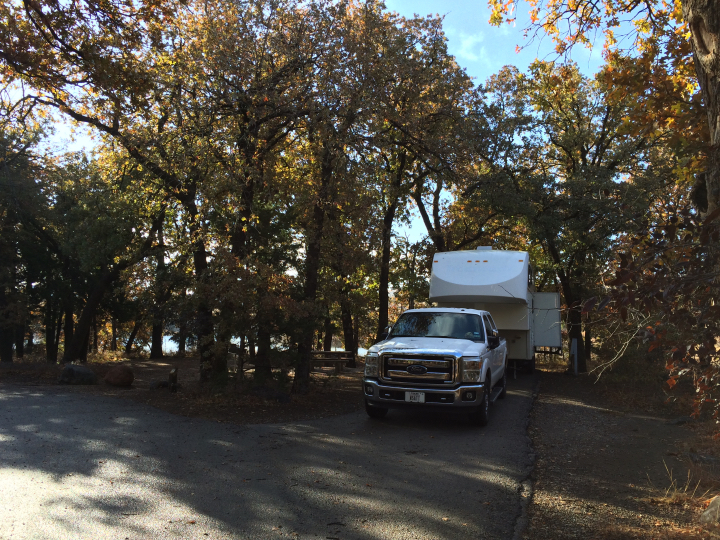 The Doris Campground is the only campground in the refuge that has facilities for RVs. The sites are nice, but there is only electricity at the site. There is a water spicket at the entrance to Loop B, and you must fill your fresh water tank there. A dump station is at the campground entrance. 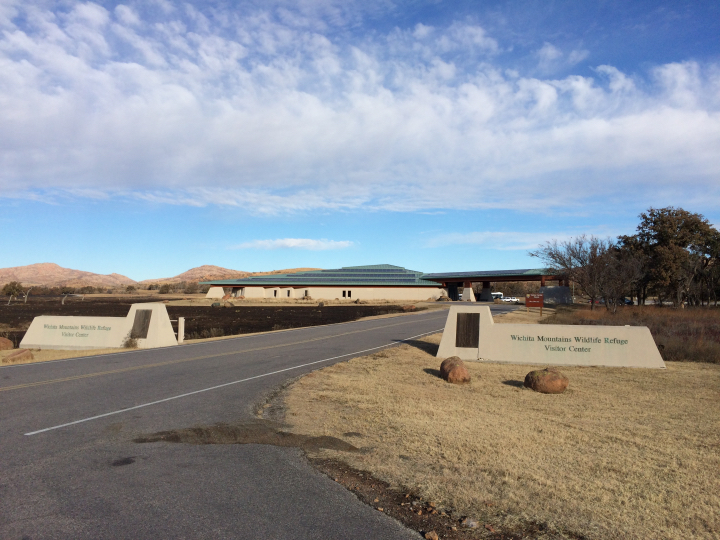 < Wichita Mountains Visitor Center. < Our campsite. [Sunday] The day started out sunny, but the wind and clouds came up as the day went on. 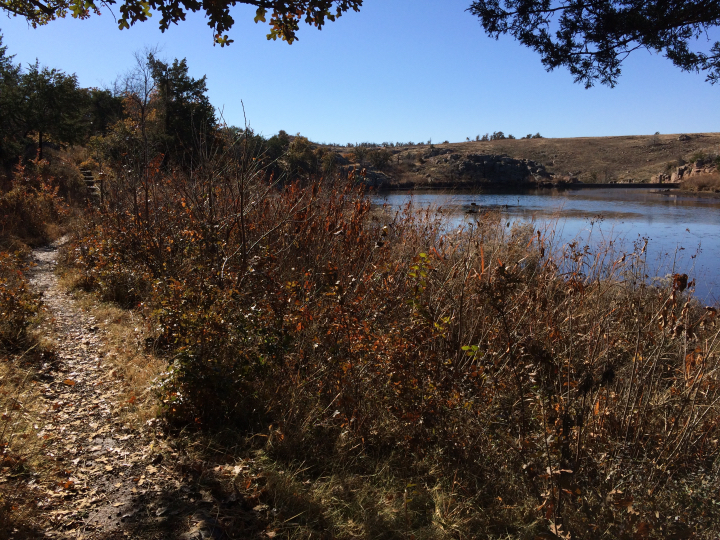 In AM we hiked the Osage Lake Trail and the Burford Lake Trail before lunch. In PM we watched the Texans on TV lose their football game, then hiked the Longhorn Trail. The wind very strong and the temperature was about 49 degrees and cloudy. We walked a total of about 5 miles today. It began to rain again after we got back to the trailer. The wildlife seen today: 2 Bison. 2 Bucks. A large flock of turkeys - about 50 birds. We saw many other birds and ducks. 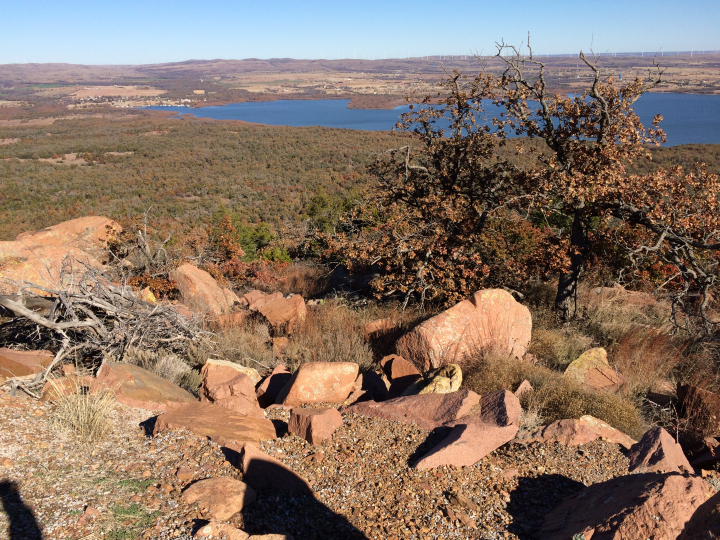 < Osage Lake from the trail. < < Burford Lake from the trail. [Monday] In the AM, we drove to a convenience store a few miles outside the park. 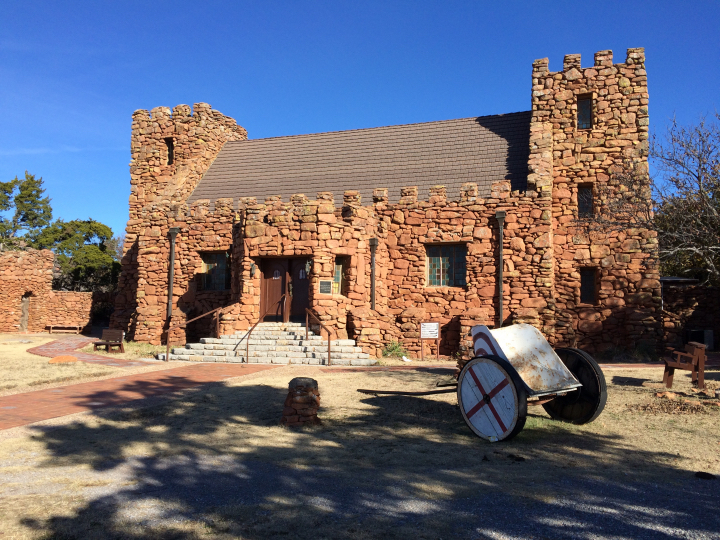 On the way, we stopped in the little historic resort community of Medicine Park, OK. There is a nice little river that runs through the town and apparently is a big tourist draw in the warm months. They are also noted for the cobble stones that are used in the construction of the houses and businesses. On the way back to the trailer, we drove the winding road up to the top of Mt. Scott. < Some of the cobble stone houses in Medicine Park. < The river runs through the town. < Mt. Scott entrance. < View from top of Mt. Scott. 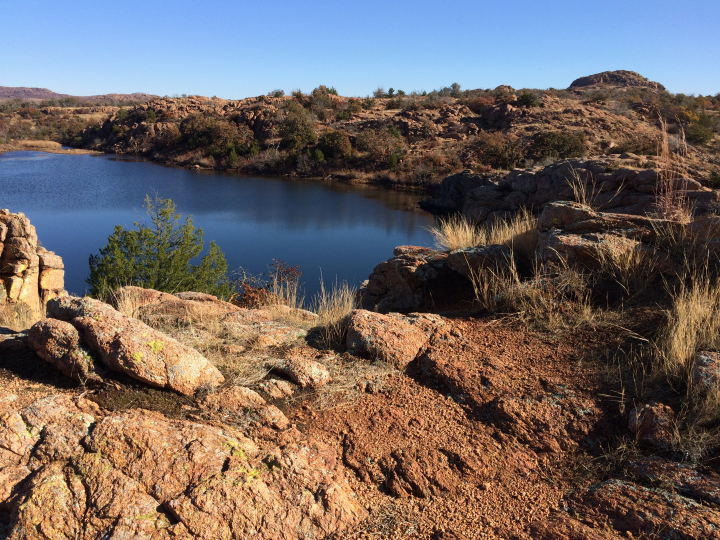 After lunch we hiked the Little Baldy Trail then Quanah Parker Lake Trail. After we got back to the trailer, we dumped the grey water and filled fresh water tank so that we could stay 2 more days. < On Little Baldy Trail. 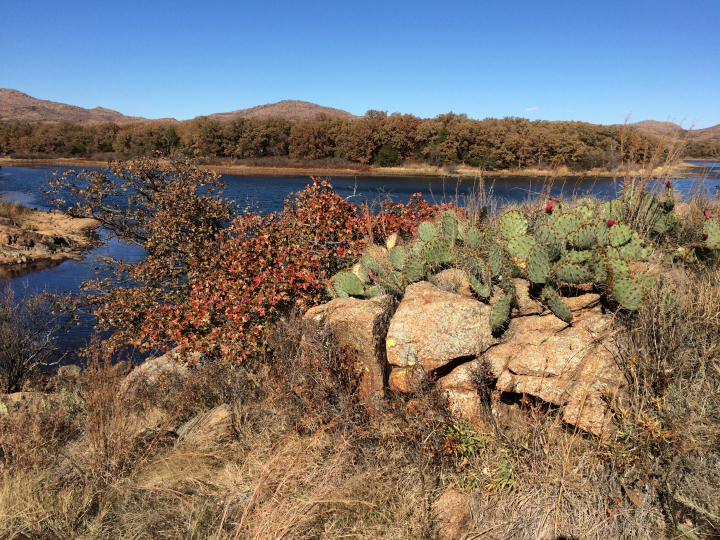 < Quanah Parker Lake Trail. 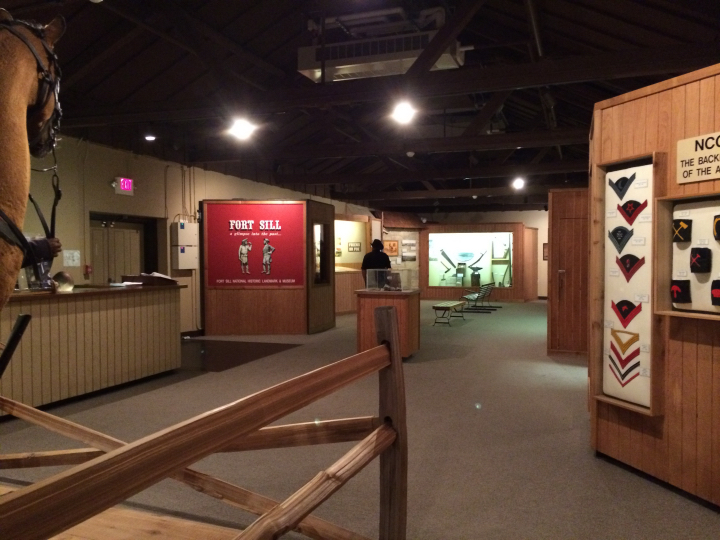 [Tuesday] In the AM we drove to the Visitors Center and looked through their Museum. It gives a good summary of the history of the area and shows all the wildlife that is in the area. < < Visitor Center Museum. Afterwards, we walked the Jed Johnson Tower Trail. 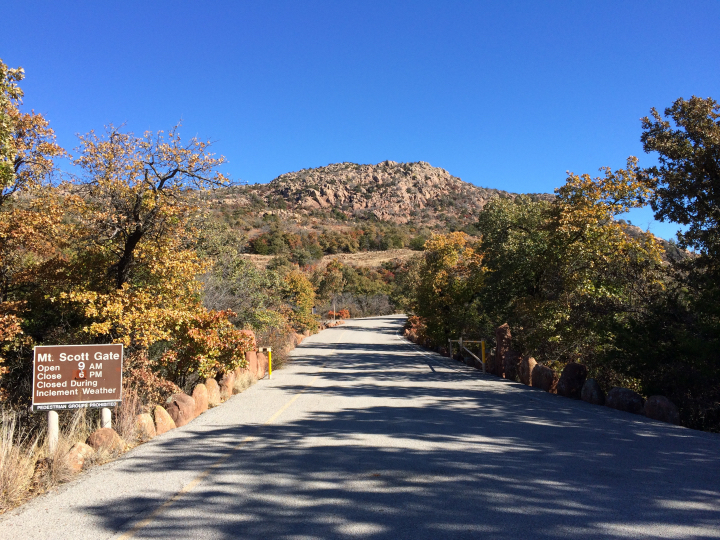 This trail leads to an observation tower (now closed) that was built by the CCC back in the 1930s. On the way, we saw a Prairie Dog Village, one of several on the refuge that had lots of animals. < The Jed Johnson Tower Trail. < View at Jed Johnson Tower. After lunch we hiked the Elk Trail, but didn't see any Elk. Then we tried to find the Narrows Trail unsuccessfully, due to lack of markings for the trail. Saw another large flock of turkeys as we left the trailhead. < The Elk Trail view. < There were still some Fall colors. 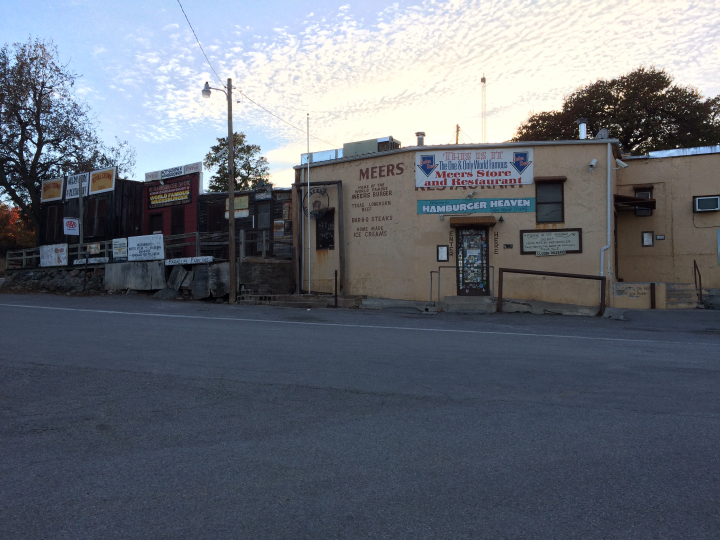 We then drove to Meers, OK to see the Ghost Town and the old country store that is famous for their hamburgers. Today, the store was closed. The day was nice and sunny, with the high around 60 and the low about 38. 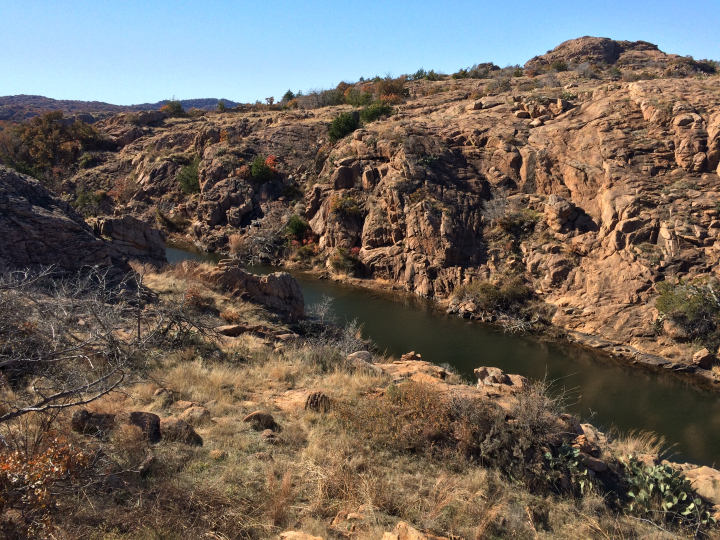 [Wednesday] This morning we left the campground and pulled trailer to The Holy City of the Wichitas. 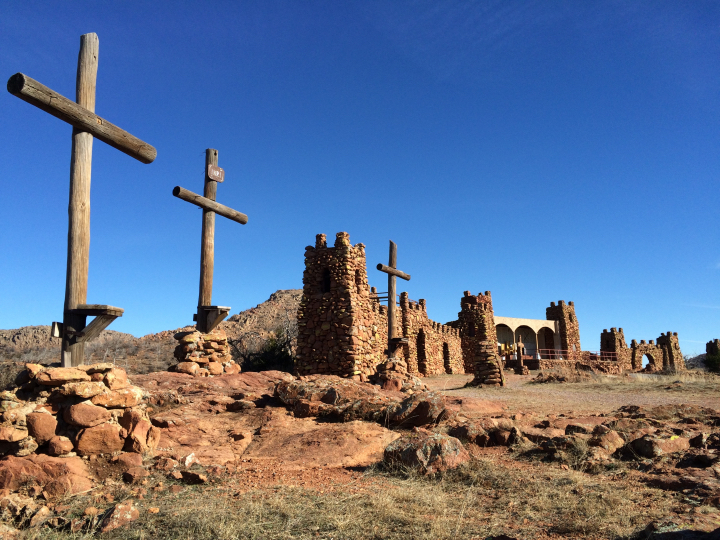 Located in the Wildlife Refuge, it is home of the annual Easter Pageant, the longest running outdoor passion play in the United States, depicting the life, death and resurrection of Jesus Christ. 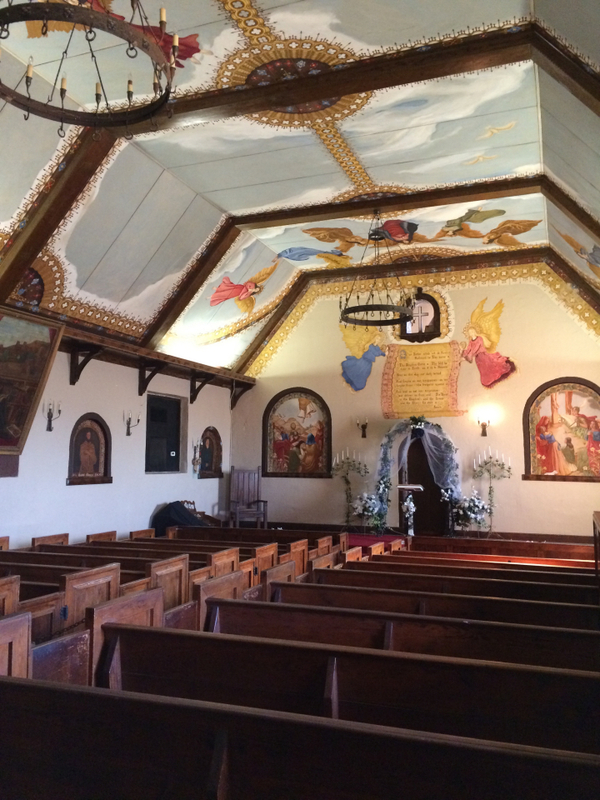 They have a chapel there that is used mainly for weddings. All the other buildings are used in the pageant, which attracts 100,000 to 200,000 people! It was a cold and windy day, so we made our visit short. < < < Holy City of the Wichitas. 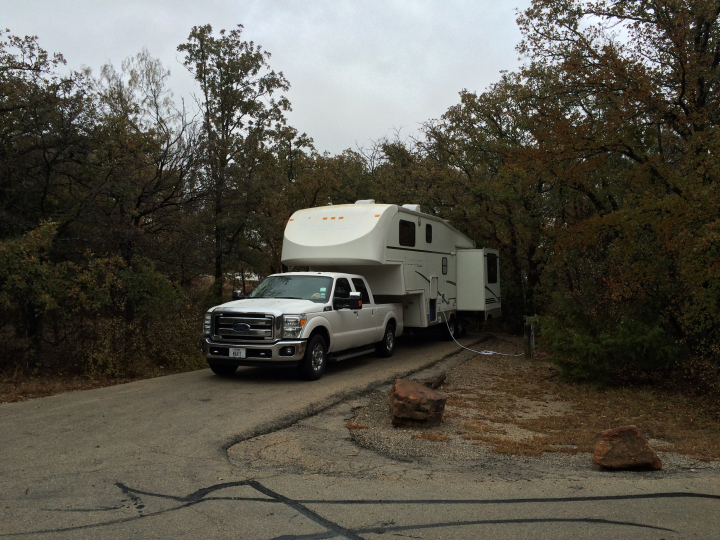 We drove out of the park and to Lawton, OK and to Buffalo Bob's RV Park. 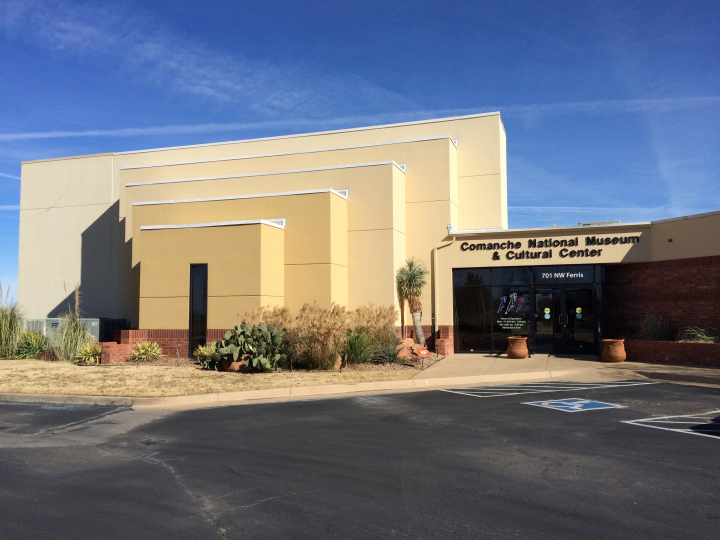 In the afternoon, we drove over to the Comanche National Museum and Cultural Center. 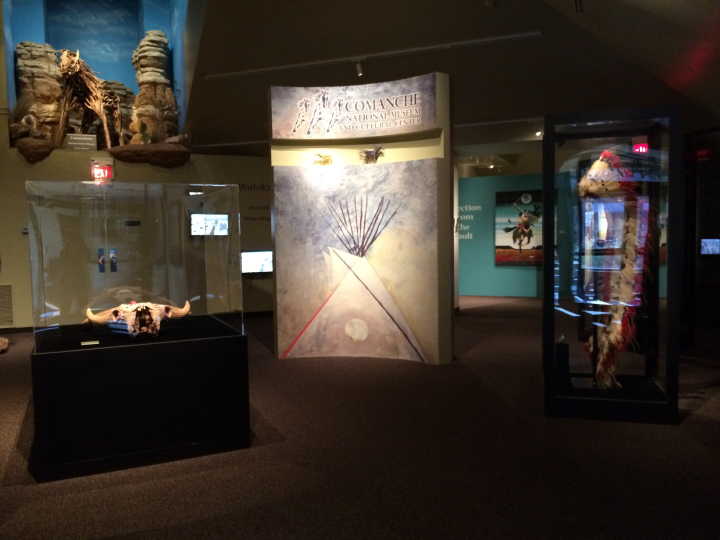 The museum gives the history and culture of the Comanche Indian Tribe. 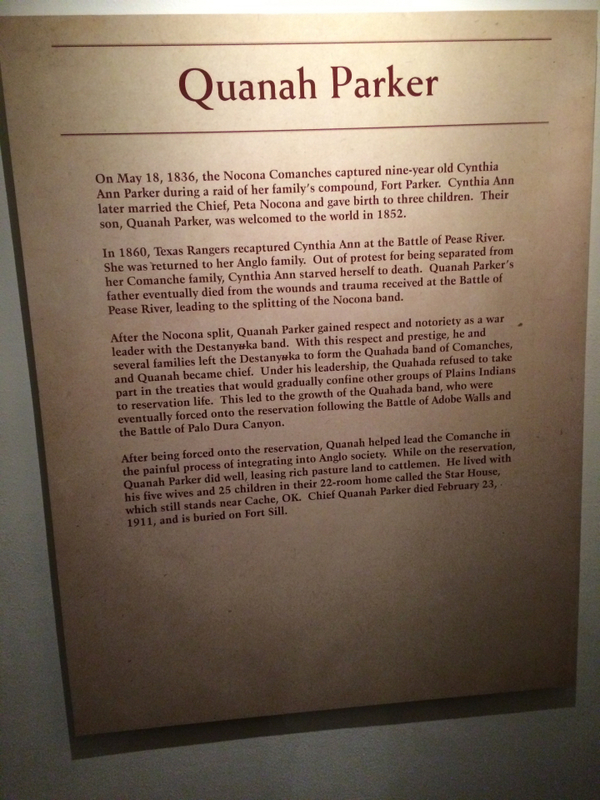 The museum is free of charge and we enjoyed talking to the Museum receptionist about the various things we learned during our travels in Texas of the Comanche Chief Quanah Parker. 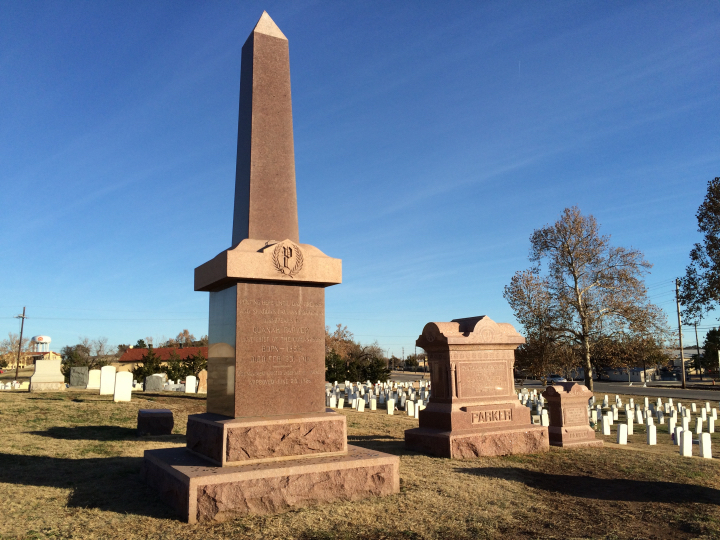 It turns out that Quanah Parker and Gernimo are both buried on the Fort Sill Army Base in Lawton, along with other famous Native Americans. 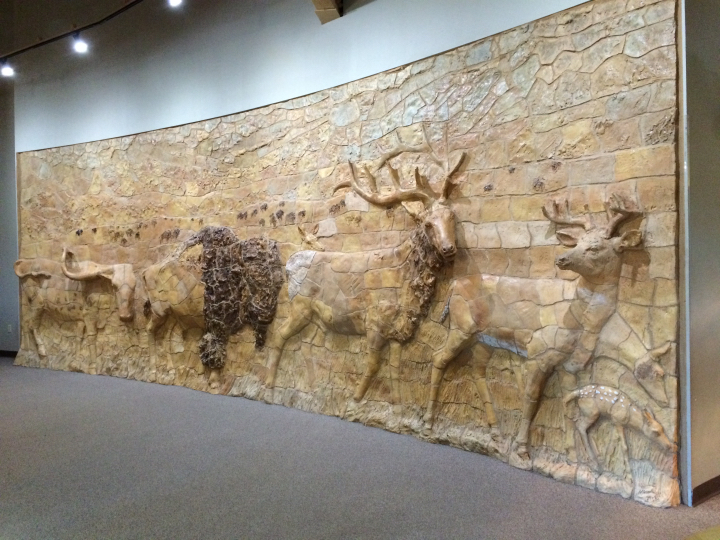 < < Comanche National Museum & Cultural Center. < The Quanah Parker story. 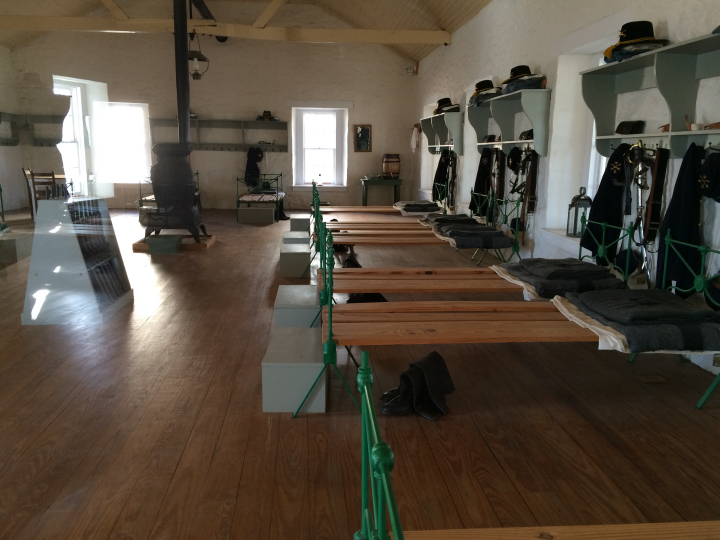 We then drove onto Fort Sill and went through the Fort Sill Museum. 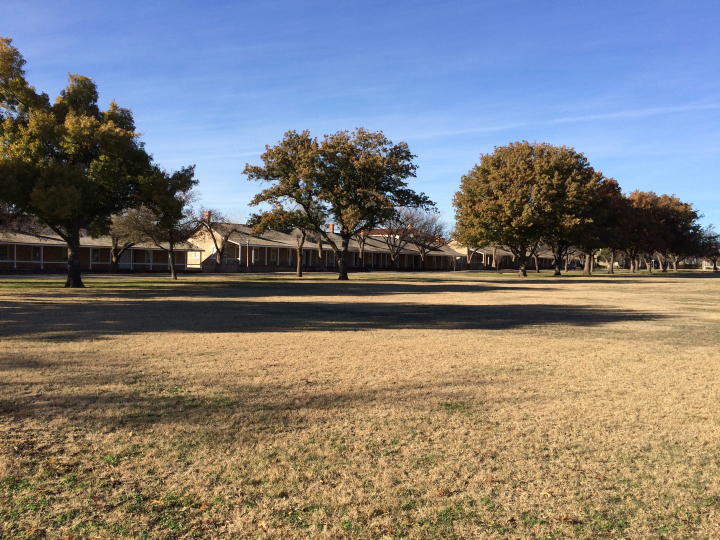 Fort Sill was built in the 1800's and it seems that most of the old builds are still well maintained. After we finished the museum, we drove to the cemetery where Quanah Parker was buried, along with his mother, Cynthia Ann Parker and family. 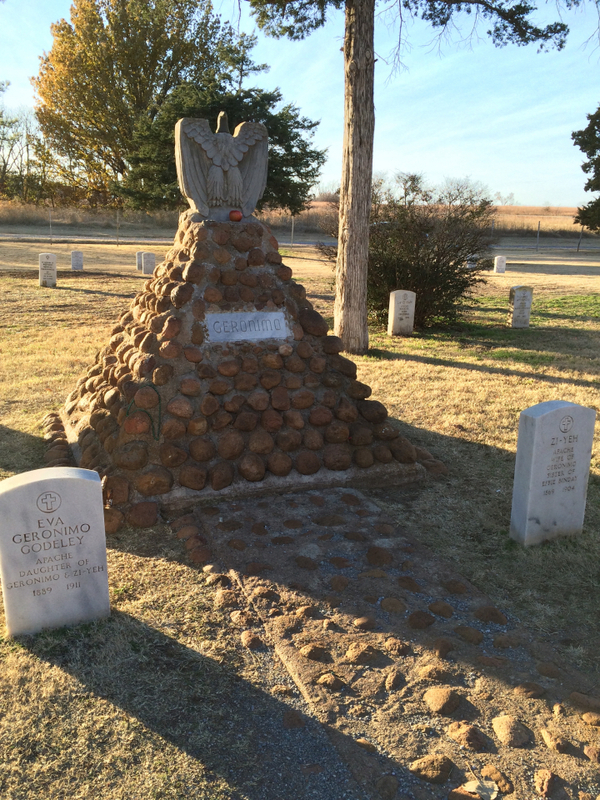 We then drove to another cemetery on the base where Gernimo is buried along with many other Native Americans. < < < Fort Sill. < Quanah Parker's grave. < Gernimo's grave. [Thursday] We woke up to a frozen water hose to the trailer when I tried to take a shower, but thanks to the fresh water tank and pump, my shower took place on time. 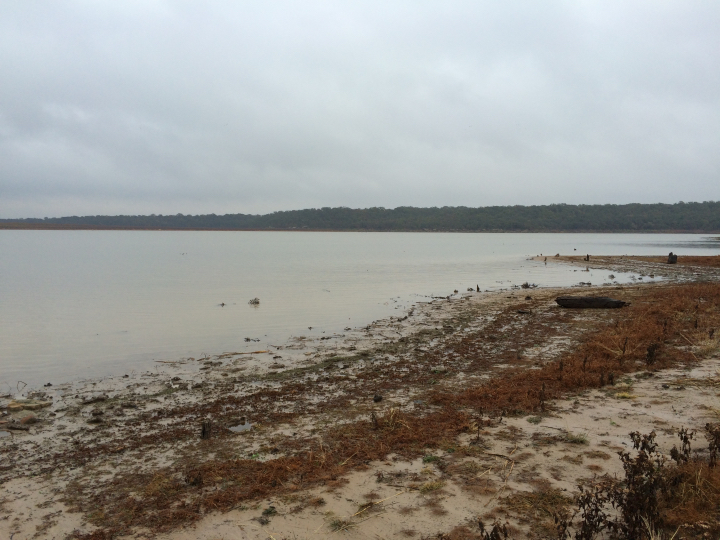 We left Oklahoma and drove to Stephenville, TX, then on the back roads to Cedar Creek Park on Lake Belton for one night. It is a nice campground, but unfortunately, the lake is probably at least 10 feet low, maybe more. 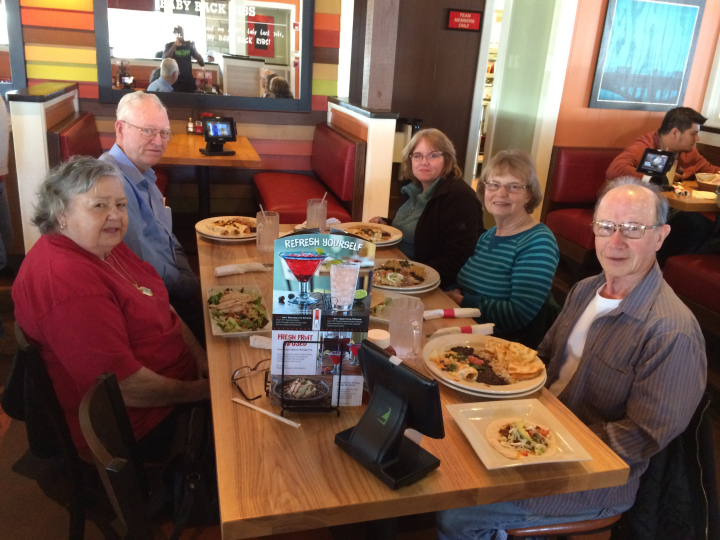 [Friday] We met Kay's cousin James, and wife, Willa Dean and their daughter Phyllis for lunch at Chillis. 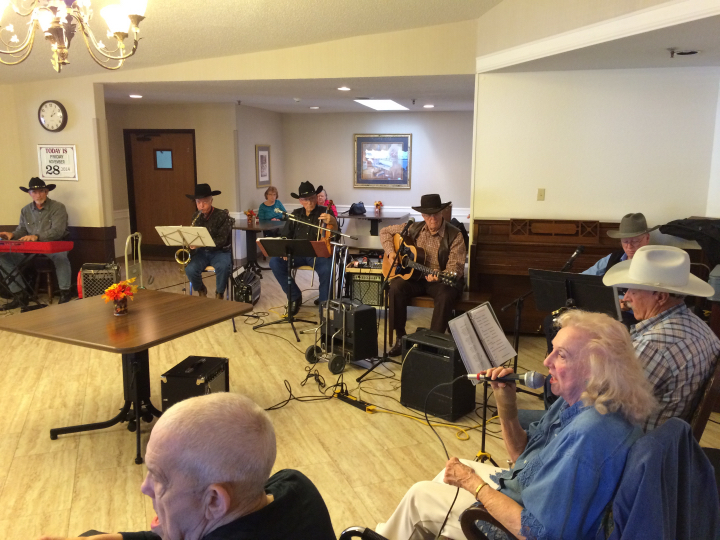 Then we went to a nursing home in Belton to hear James and his band, The James Gang, play for the residents. 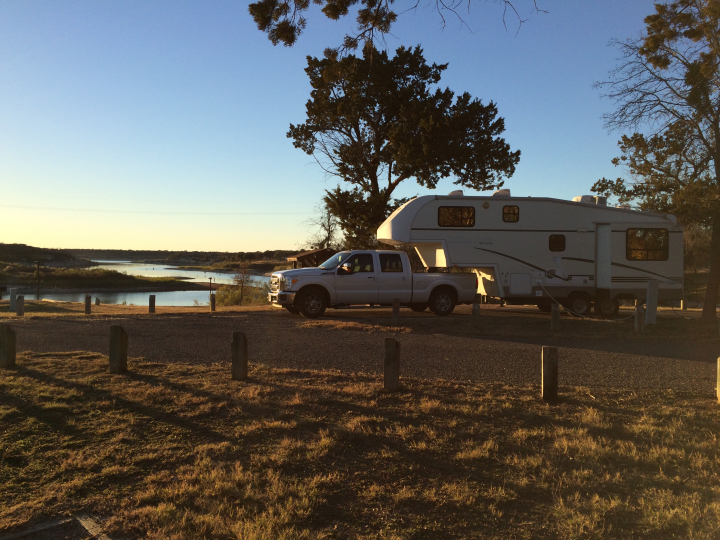 Afterwards, we drove to Rockdale to Rockdale RV Park. < Lunch was good. < Everyone enjoyed the James Gang. [Saturday] We drove back home. We arrived about 1:30. This draws to a close our brief vacation to Oklahoma. We hope you enjoyed the photos and brief descriptions of our activities. God willing, join us again soon for another RV or automobile travel adventure.